Pacific dogwood is a small native tree species (to 20 m tall) that is found along the Pacific Coast of North America from California to British Columbia (USDA 2010). In British Columbia, it is found in the southwestern corner of the province, both on the mainland and on Vancouver Island. It occurs on mesic, nitrogen-rich forest soils, and is a relatively common part of the shrub layer in mixed and coniferous forests in the region. During spring flowering, this species is readily visible along forest edges prior to full leaf out. The large showy 'flowers' are distinctive and eye-catching. The 4-7 large white or pink-tinged 'petals', however, are actually bracts. The actual flowers are tiny (1.5-2 cm wide), greenish-white (usually purple-tinged or purple-tipped), and occur in clusters in the center, framed by the large bracts. The oval leaves are opposite, and have characteristic 'Cornus' veins that curve parallel to the leaf edge. 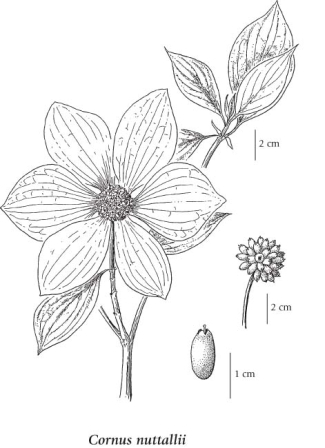 The Pacific dogwood was adopted as British Columbia's official floral emblem in 1956. Irregularly branched deciduous tree up to 20 m tall; bark blackish-brown, smooth, becoming finely ridged with age, young branches greyish-purplish. Opposite, deciduous, oval, stalked, pointed at the tip, 4-10 cm long, deep green above, greyish-brown below, turning red in the fall, characteristic veins curving parallel to the leaf edge. Inflorescence of numerous, unstalked, hemispheric clusters 1.5-2 cm wide, subtended by 4-7 conspicuous white or pinkish-tinged, large (2-7 cm long) showy bracts, flowering in spring and often again in the fall; petals greenish-white, usually purplish-tinged. Fleshy drupes, 10 mm long, bright red. Mesic forests in the lowland and montane zones; common in SW BC; S to CA, disjunct in ID. A shade-tolerant/intolerant, submontane to montane, Western North American deciduous broad-leaved tree distributed more in the Pacific than the Cordilleran region. Occurs in maritime to submaritime cool mesothermal climates on moderately dry to fresh, nitrogen-rich soils (Moder or Mull humus forms). A shrub or small tree in disturbed communities and coniferous forests on water-shedding sites, most often on colluvial slopes. Its occurrence decreases with increasing latitude, precipitation, and continentality. Characteristic of young-seral mesothermal forests.